It’s not all about aliens in New Mexico. A new guest house complements the lovingly restored 1910 Parsons House. Homestyle fire stations from the bungalow era. An eclectic b&b that combines Victorian and Arts and Crafts detailing. Appropriate tile resources for kitchens and baths. Making a Craftsman kitchen work for today. Bringing back a bungalow with respect for the past. Children and pets coexist with a great collection of Arts and Crafts furnishings. Practical tips on how to educate yourself before you jump into collecting. An entrepreneur who embraces the breadth of the Arts and Crafts ethos. A modern take on a second-story addition. 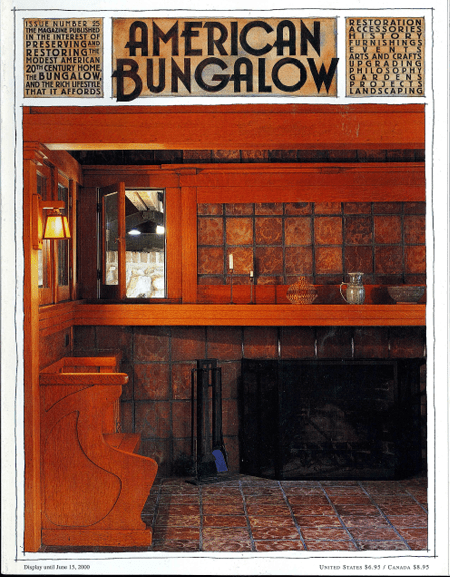 Was the original Arts and Crafts movement destined to fail? New bungalows for a Bainbridge Island neighborhood. Review by Beth Ann McPherson. The past is a pretty fine model for the new millennium.